River Valley defenders Kelsey Brown (32), Lauren Twyman, Cierra Roberts (1) and Savannah Reese apply pressure to Jackson’s Katelyn Webb during the first half of Monday night’s Division II sectional semifinal basketball contest at Wellston High School in Wellston, Ohio. River Valley sophomore Sierra Somerville (22) drives to the basket past a Jackson defender during the second half of Monday night’s Division II sectional semifinal basketball contest at Wellston High School in Wellston, Ohio. WELLSTON, Ohio — It was everything you’d expect in a play-in game in which the winner faces the top seed in the tournament bracket … including the final result. 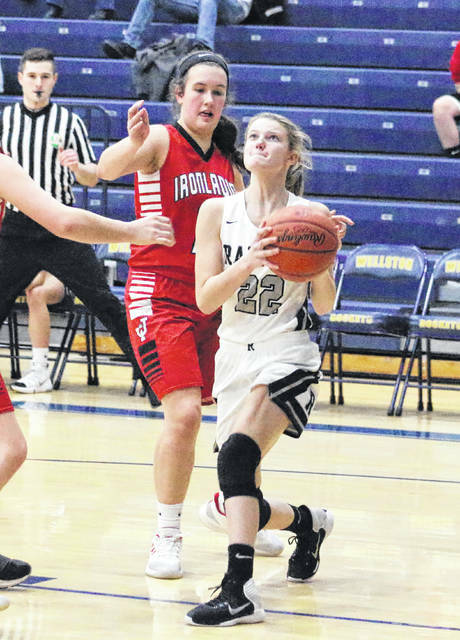 Eighth-seeded River Valley led the final 8:13 of regulation and used an 11-5 fourth quarter surge to move on Monday night following a 35-27 victory over ninth-seeded Jackson in a Division II girls sectional semifinal basketball contest at Wellston High School. The Lady Raiders (6-17) never trailed in the first half and twice led by five points in the first quarter, but the Ironladies (2-19) never trailed by more than a possession in the second frame while whittling the deficit down to 15-13 at the break. 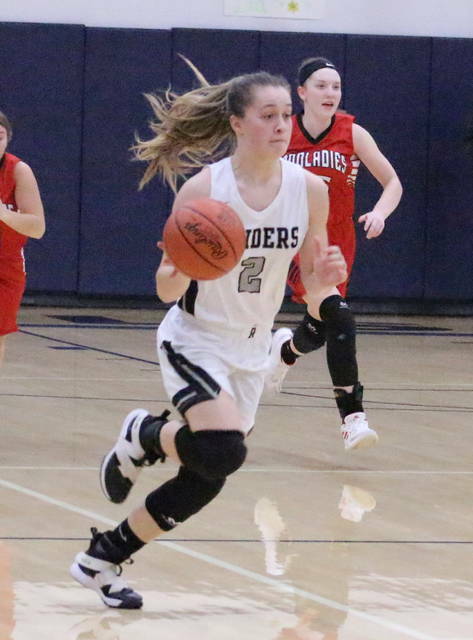 JHS took its only lead of the night at the 5:45 mark of the third as Kaitlyn Kight netted a basket for a 19-17 advantage, but the Silver and Black responded with a 7-3 run over the final 4:05 to secure a 24-22 edge entering the finale. Jackson went more than four minutes without a point down the stretch, and the Lady Raiders reeled off five straight points for a seven-point cushion. The Red and White answered with five consecutive points to close the gap down to 31-27 with 3:05 left in regulation, but the guests were held scoreless the rest of the way. River Valley tacked on a pair of Hannah Jacks’ buckets in the final 2:36 of play to wrap up the eight-point outcome — the Lady Raiders’ largest lead of the night. Neither squad shot better than 30 percent from the field, and there were only five ties and three lead changes in the contest — with a majority of those coming in the third canto. Jackson led only 1:40 of the 32-minute affair. 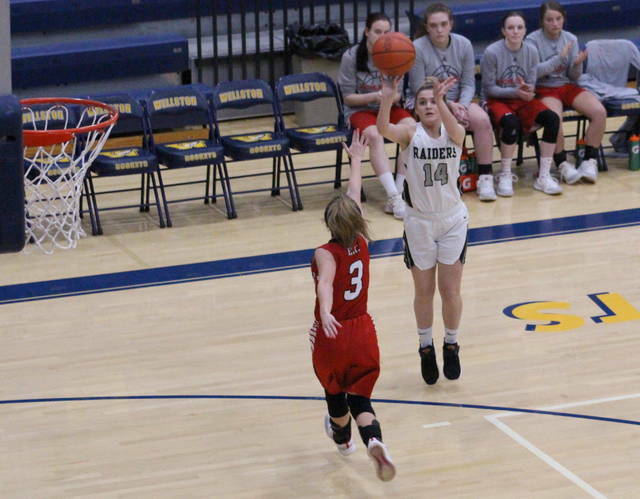 The Lady Raiders secured their second tournament victory in as many years and will once again face Vinton County in a sectional final for a second postseason in a row. That contest against the Tri-Valley Conference Ohio Division champions will take place at 1 p.m. Saturday at Wellston High School. Afterwards, RVHS coach Stephen Roderick noted that the contest was anything but pretty. But, as he mentioned, it’s not the time of year to worry about style points … only results. With that, the third-year coach was pleased with the way his troops found a way to grind out this win … and put themselves in a position to win a sectional title Saturday. “Regardless of our record, this a good win for our program. We play in a tough league and it tested us, but the season starts over when you get to the tournament. It’s not easy to get a tournament win, so it was nice to get out of here with one and have another game to look forward to,” Roderick said. “It was hardly our best effort, and Jackson had a lot to do with that, but our girls came up with the big plays when we needed them. The Lady Raiders built leads of 5-0 and 8-3 in the opening stanza before taking an 8-5 lead through eight minutes of work, but the Ironladies countered with a 4-2 run at the start of the second to close to within 10-9 with 4:48 remaining in the half. A Lauren Twyman free throw at the 3:18 mark capped a 4-0 spurt that gave RVHS its largest lead of the second frame at 13-9, but Jackson countered with a 4-2 run that led to a 15-13 contest at the intermission. All five ties came in the third quarter, the last of which came at 22-all following a Bronwyn Nelson basket with 27 seconds left. Kelsey Brown’s offensive putback with 13 seconds remaining ultimately gave the Silver and Black a permanent cushion as the hosts took a 24-22 edge into the finale. Both teams missed their first six shot attempts of the fourth period, but the Ironladies were ultimately never closer than their two-point deficit at the start. Jacks scored seven points and Twyman added the other four down the stretch run, allowing River Valley to wrap up the three-possession triumph. The Lady Raiders netted 14-of-51 field goal attempts for 27 percent, including a 2-of-18 effort from behind the arc for 11 percent. The hosts were also 5-of-14 at the free throw line for 36 percent. Jacks and Twyman both paced RVHS with 13 points apiece, followed by Brown with four points and Savannah Reese with three markers. Kaylee Gillman completed the winning effort with two points. Jacks posted a double-double by hauling in 12 rebounds, with Twyman and Brown respectively grabbing six and five caroms. Jackson made 10-of-53 shot attempts for 19 percent, including a 2-of-26 effort from 3-point territory for eight percent. The Red and White also went 5-of-10 at the charity stripe for 50 percent. Nelson led JHS with nine points and Gracie Walburn chipped in six points, while Katelyn Webb and Lauren Elliott respectively added five and three markers. Kight and Taylor Evans completed the scoring with two points each. Walburn pulled in a team-best dozen rebounds, with Evans grabbed five boards and Webb hauled in four caroms. River Valley also defeated Jackson in the regular season by a 36-24 count back on Nov. 29, 2018. 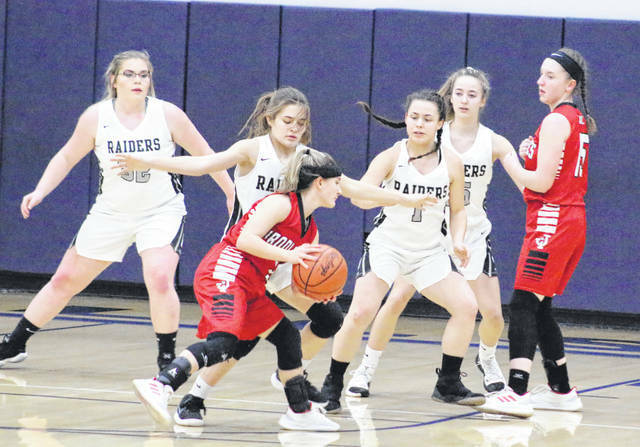 The Lady Raiders lost both regular season contests to Vinton County during TVC Ohio play and also fell by a 72-26 count in last year’s sectional final at Logan High School.